When future roommates Elizabeth and Lauren begin emailing the summer before college starts, they aren’t interested in a conversation beyond who is bringing the mini fridge and who has a microwave. As the summer progresses, the girls discover that change is already afoot and they each must learn how to handle old friends, new boyfriends, familial ties, and their own uncertainty about future plans—including how they feel about each other and the surprising friendship they’ve developed. 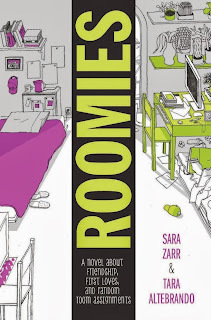 Funny, smart, and modern, Roomies is a fun back-and-forth novel about two girls who aren’t as different as they think they are, despite the living on the opposite sides of the country and coming from very different families. Both Lauren and Elizabeth have strong personalities, and watching them learn how to handle their new roles and changing emotional landscapes is sometimes funny, sometimes, heartbreaking, but always ultimately satisfying as they confide in each other and support each other. Altebrando and Zarr have great writing chemistry; Roomies captures the turbulent emotions of teenagers on the cusp of big change—the excitement, fear, nostalgia, worry, and impatience—without being a sentimental book. Cover Talk: I really, really like this cover! The art is a lot of fun, and I like the colors used. The cover really captures the mood of the book.